The Morris James Personal Injury Group is proud to announce the recipient of the 2017 Golden Gavel Award… PETE JONES! The Honorable M. Jane Brady, Superior Court Judge of the State of Delaware, presented the award to Pete on Saturday, May 13, 2017. 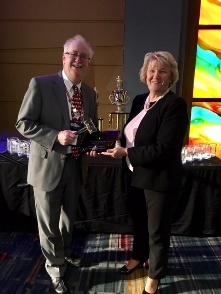 "The Justice Gene Franchini Golden Gavel Award recognizes any adult individual who has demonstrated exemplary dedication and commitment to the goals and ideals of the national high school mock trial program." Watch the video to hear Judge Brady's speech and presentation of the award to Pete.